Recoil-reducing buttstock fits AKM style rifles with a stamped receiver (WASR, GP1975 and the AK74). Also fits Saiga style rifles and shotguns, but requires some simple modifications with a dremel tool. 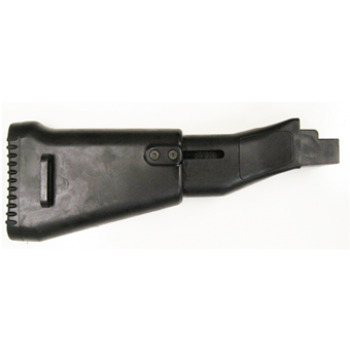 The recoil reducing buttstock contains a patented mechanism that dramatically lowers felt recoil. We extensively tested this recoil reducing buttstock using the LaodForce - 250 Recoil Force Measurement System with the Saiga 12 ga. shotgun with regular buttstock and after swapping to the Recoil reducing Buttstock (RRBS). Recoil was reduced by over 42% with heavy game loads! This allows for faster follow-up shots and much better accuracy! High: 37 lbs. l 23 lbs. Low: 29 lbs. l 17 lbs. Avg. : 32 lbs. l 20.5 lbs. High: 49 lbs. l 29 lbs. Low: 40 lbs. l 21 lbs. Avg. : 45 lbs. l 26 lbs. High: 44 lbs. l 31 lbs. Low: 38 lbs. l 30 lbs. Avg. : 40 lbs. l 31 lbs.